Hey folks, I’m Marty – you can find me online as marblemartin on tumblr, twitter, FA… pretty much everywhere. I’m a nonbinary transmasculine artist living in Indianapolis, Indiana, which is luckily a small haven for the LGBTQ community in the midst of all these cornfields. I draw comics and recently opened up a little bookbindery/studio. I love monsters, critters, aliens, and robots. There’s something freeing about not adhering to human beauty when drawing these things! I struggle with depression and anxiety alongside my dysphoria – both the social and bodily types – and this seems to be a common issue in the queer community. For me it manifests with me picking at my cuticles and skin, a kind of dermatillomania. 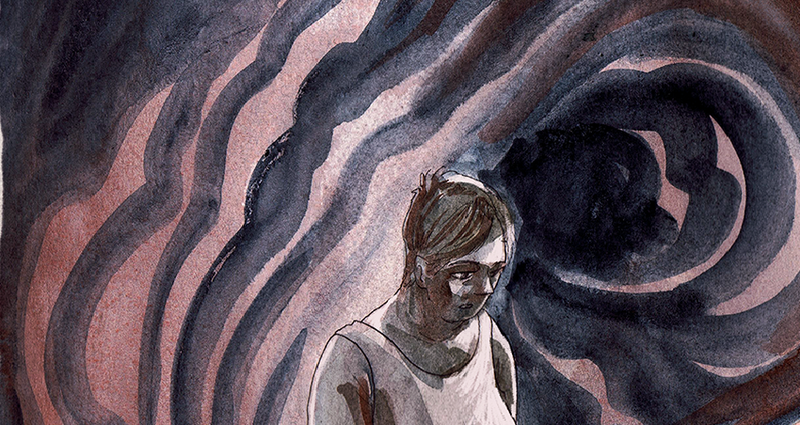 It’s not quite what people expect when they think of self-harm, but it’s still destructive. I sometimes get weirdly freaked out about depicting myself in art – am I being too accurate and ‘misgendering’ myself visually, am I being too idealistic? So I decided to get out my hangups over my picking in a comic, just go full William Blake and bare my ugly side. Bring on the scabby chrysalis, I’m ready to turn into a beautiful queer butterfly. Support GenderTerror and its creators by becoming a part of our Patreon! Every dollar counts!